Holy cow! I stopped in to Wal-Mart this evening [sigh...] and came out with a Crop-A-Dile II in pink! 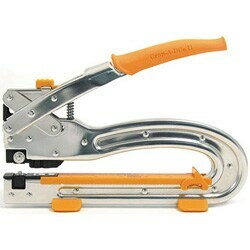 I've been toying with buying one of these fun tools, but always seem to use my craft coupon on something else. Well, tonight Wal-Mart had these marked to $20 clearance and I thought, "why not?" Imagine my surprise when the register gave it to me for only $15. My Wal-Mart had at least a dozen on the shelf. I bet yours will, too. I like how this tool punched through notebooks. I like to cover small notebooks and this works for punching holes for threading ribbon.